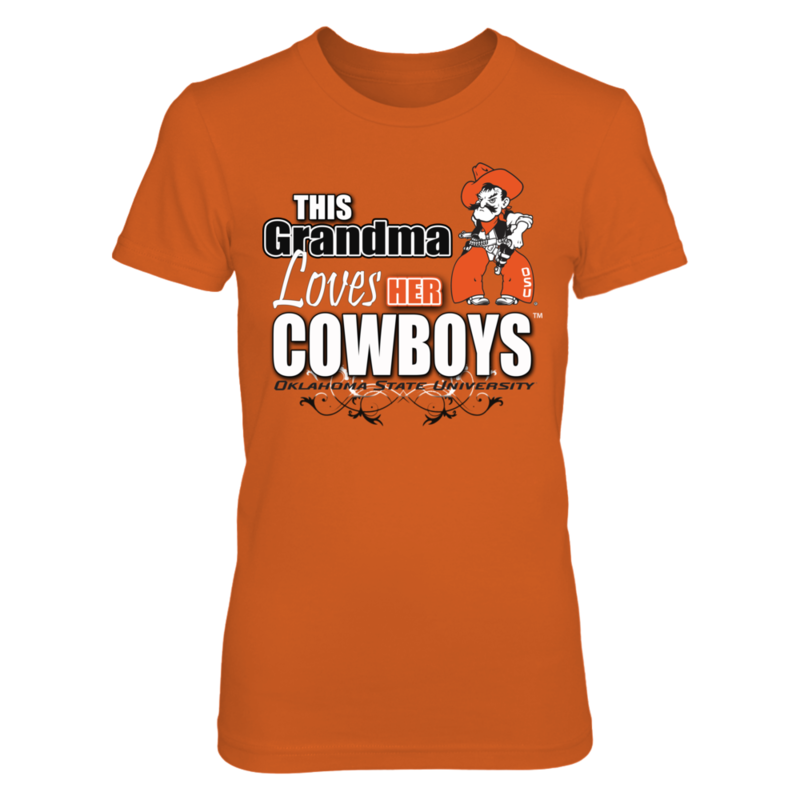 Each OKLAHOMA STATE COWBOYS: This Grandma Loves her Oklahoma State Cowboys- Officially Licensed Oklahoma State Merchandise fanatics design is custom-made and printed when the countdown ends. Popular designs may be available on our site after the campaign! This luxurious & stylish premium tee is the perfect way to wear your passion with pride. A perfect weight and tapered neck and shoulder makes for a flattering fit. 4.3-ounce, 100% combed ringspun cotton fine jersey. Exceptions: Grey - 90% cotton, 10% polyester. This superior fitting fabric and lightweight 100% ring spun cotton shirt is a perfect way to wear your passion. 4.3-ounce, 100% ring spun cotton. Exceptions: Grey - 90% cotton, 10% polyester. This superior fitting fabric and lightweight 100% cotton shirt is a perfect way to wear your passion. 100% preshrunk Ultra Cotton 6 oz. T-Shirt. Exceptions: Grey is 90/10. Dark Heather is 50/50. Garnet, Tennessee Orange, & Tropical Blue are 100% preshrunk 5.3 oz. cotton T-Shirt. This stylish tee is the perfect way to wear your passion with pride. 6.0-ounce, 100% preshrunk cotton. Exceptions: Grey is 90/10. Dark Heather is 50/50. Carolina Blue, Garnet, Gold, Maroon, & Tropical Blue are 100% preshrunk 5.3 oz. cotton T-Shirt. This is that comfy hoodie you're always stealing from someone else's closet (girlfriends we're looking at you). A perfect blend of cotton and polyester will keep you warm and comfortable for years to come. It’s got a roomy front pocket, double lined hood, double needle stitching and 1x1 ribbed cuffs and waistband with spandex for ultimate comfort, quality and style. 13.5-ounce, 50% cotton, 50% polyester. This fabric represents a new benchmark in value. You will be amazed by the ultra-soft hand and performance of this exclusive fabric. 3.9-oz, 60% cotton, 40% polyester. A simple, sleek 100% ultra cotton long sleeve shirt. At 6 ounces with double needled stitching throughout, this garment guarantees long lasting wearability and durability. 6-ounce, 100% ultra cotton. Exceptions: Grey - 90% cotton, 10% polyester. Perfect for relaxing, this fleece crew is lightweight and roomy! A perfect blend of cotton and polyester will keep you warm and comfortable for years to come. 8-ounce, 50% cotton, 50% polyester fleece. Stickers are rectangular cut with 4"x3.5" on Matte Vinyl, 4mil thickness. Great for smooth surfaces like laptops, windows, walls, books etc. Take your time. We accept returns within 30 days after delivery. Printed in United States. We print after the campaign ends successfully. No inventory. No waste! Exclusive Designs. Unique designs. Available for only a short time.